Ten ways to go doily crazy! From aged yellowing lace on occasional tables to white laser cut ones under boardroom biscuit plates, the doily has been around since the 17th century and seems it’s here to stay. The wide spread love for everything cute and vintage has benefited massively from the recent crochet resurgence of the last few years; and whilst many are still scarred from toilet roll holders dolls, there’s still it seems a market for intricate, lace style crocheted knick-knacks that just generally make life prettier and cute. Doilies are definitely one form in which crocheting reigns, benefiting from its superior circular build abilities. They’re great for everything from coasters and table mats to dreamcatchers and lampshades. I even adapted one to make a summer jug cover by using a really fine thread and attaching beads around the outside. So whether you’re looking to make doilies or simply make use of a stash you’ve found in a charity shop or attic; I bring you ten ways to go doily crazy. I’ve wanted to start sharing crochet tips and tricks for a while, however I’m far too lazy as a blogger to commit to a #TuesdayTutorial or a #ThursdayTip and all that jazz! So in an attempt to make a start at sharing my love of crochet hacks I bring you the Jogless Crochet Stripe. I’ve seen a number of different methods for this technique, however this video was for me the most effective and easy to accomplish. YouTube video courtesy of Deja Jetmir of Crochet Ever After can be found here. If you’re new to crochet and looking for resources to get you going, you can find some handy links on my ‘how to crochet’ section. Stripy sock puppy – crochet pattern, amigurumi pattern, pdf from lilleliis pattern here. Beach babe amigurumi pig by Ilaria Caliri (aka airali) pattern here. I’ve been pretty much obsessed with the sea since my early childhood days, spent fossil hunting in Scarborough. From the gorgeous colours of the ocean to the beautiful ocean animals what’s not to love. There’s a plethora of sea inspired crochet ideas from amigurumi to blankets and the latest craze in all things mermaid. Here’s a run down of my top favourite ocean inspired crochet projects from my recent Pinterest frenzy. You can find links to all patterns by clicking on each photo. Plus check out my mermaid dedicated post here for the best in crocheted mermaid tails, just in time for those snugly nights in. Gorgeous free crochet cat pattern! During my current kitten obsession, I care across these gorgeous dumpling kitten patterns. The pattern comes courtesy of Sarah Sloyer and can be be found on her Ravelry store here. They were recently featured on crochetnow.co.uk so you know they’re bound to be a big hit. I know my Ragdoll Poppet is going to love one. Dumpling Kitty is a cute pudgy kitty whose pattern is available for free! Her body is crocheted with a flat base so she sits nicely wherever you place her, waiting patiently for treats. Finished size: Approximately 4” tall when made with the indicated yarn and hook size, though your finished size may vary depending on your yarn brand and tension. Sarah is happy to offer email support if you need any help while working through my patterns, or notice any errors! This pattern is for personal use only. They look super cute and a really quick project for any experienced crocheter. It’s been a year since I put the hook down, due my claw hand getting worse. However now the clock are soon to go back and the heatings been on for a few days I’m feeling ready to get the crochet hooks out. Octopus for my friends newborn baby. I honestly didn’t realise how popular these were and how great they are for newborns. Pattern courtesy of the friendly red fox. Some lovely crocheted cat toys for my darling ragdoll Poppet Aurora. Patterns here. I’ve recently moved house and have been looking for some new puffies for the lounge. These look perfect and the colours so inspiring. No pattern alas, however I’m sure I could freestyle something very similar. So that’s the first few of my projects. I’d love to hear your latest projects or ideas, what you most looking forward to this autumn? When it comes to crochet being able to surprise your friends with something they love (in this case pokemon) in crochet form is always a great feeling. To celebrate the latest craze Pokemon Go, I’ve rounded up my favourite collection of pokemon crochet, there’s something for everyone. 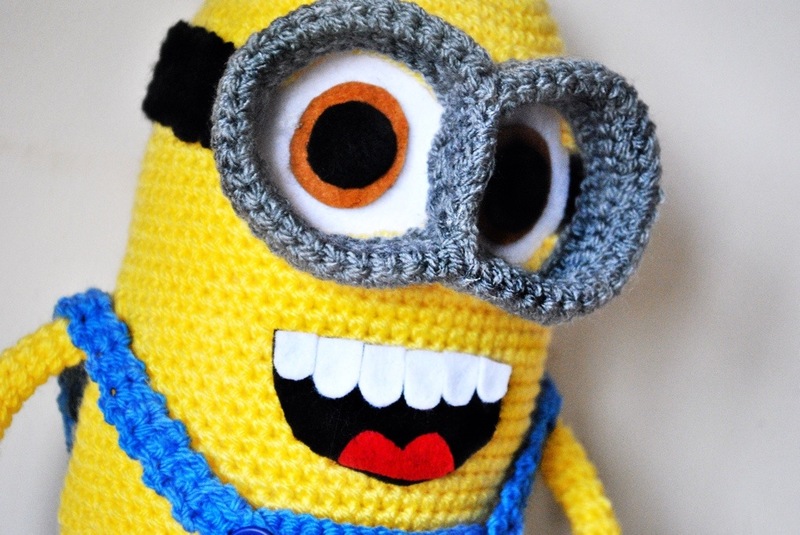 Following the current trend of cute crocheted film characters I couldn’t resist bringing one of Grew’s minions to life. 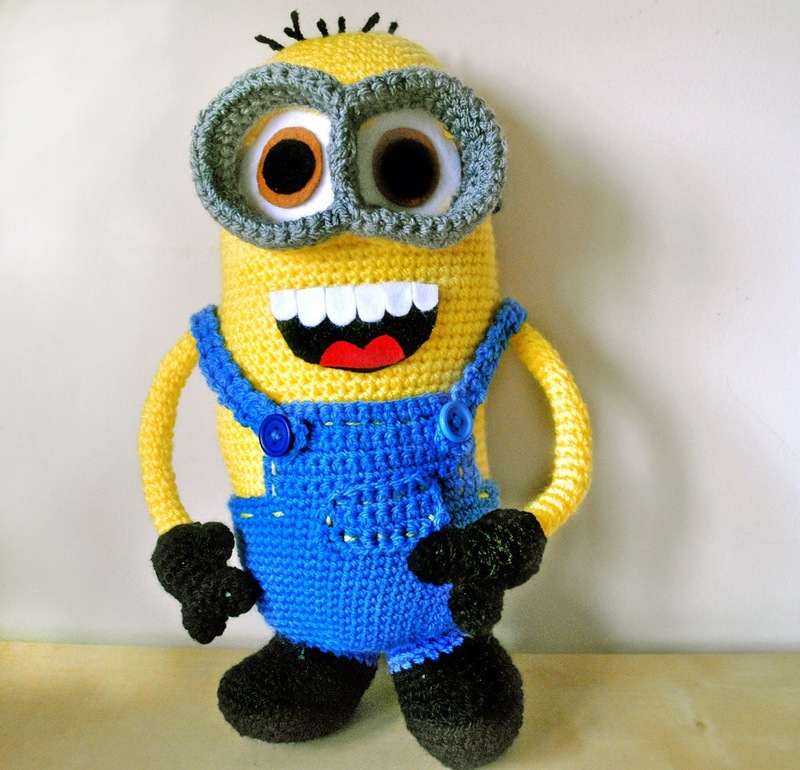 One of my old colleagues had a seriously big minion obsession and I’d planned to make her this little fella long before I got around to hooking him up! He was pretty easy to crochet and his dungarees and goggles are fully detachable making him a real treat for any little ones in your life. I cheated a little on some of the parts assembly, and relied a little more than normal on the glue gun rather than stitching. How shameful I hear you cry, however if it means I get to start on the next project a bit quicker then I sleep happy. The pattern I used can be found here and I’m sure you’ll have him whipped up in no time and then you can ‘whip’ him into doing your bidding like only a minion knows how. Happy New Year Everyone…Blessed Be…and Happy Hooking! One of the most exciting things I have finally found is a method of creating the perfect crochet sphere. I was sure I’d stumbled across this some time ago but could not for the life of me find it again. This time with my ‘bookmark’ firmly clicked and double checked I have the pleasure of sharing this with you all. Finally a little handy mathematics to help crocheters everywhere achieve a perfect sphere. So whether you’re looking to make a cute little amigurumi head or a ball toss game for the kids I hope this resources helps. You can find the link to this in my free patterns page…enjoy. Image above kindly borrowed from www.repeatcrafterme.com a fantastic site with lots of lovely patterns…also worth a look. The second really handy link I stumbled across was by fellow crafter mooglyblog.com who has put together a really easy to follow post featuring 5 basic crochet shapes. These handy tutorials are perfect for free styling and a must have when you come to start designing your own patterns. You can also find this link in my free patterns page. I love magazines – the way they feel in your hand – the excitement when they drop through the letter box – clicking the kettle on knowing the next few moments are dedicated to seeing what exciting inspiration lies inside. As much as I love the digital world and couldn’t be without my netbook, laptop, smartphone and kindle fire, you just can’t beat a shiny magazine. At the moment my favourites are Mollie Makes, the Simple Things and Simply Crochet. If you are looking to get yourself a crafty mag subscription then these are definitely worth it! In fact I think you can still get 3 issues of Simply Crochet for £5.00 #Bargain visit http://www.myfavouritemagazines.co.uk for more info. Say hello to Cornelius. He’s a cheeky blue bear that like me simply adores a good brew. I’m very excited about this one as it’s the first amigurumi project which I ‘freestyled’ into creation. I usually follow Ana Paula’s patterns as her Amigurumi World – Seriously Cute Crochet book is one of the best I have seen for beginners. The head followed the standard increase patterns of 6, 12, 18, 24, 30, 36, 42 with 5 central rows (one row less than increases, which is a good rule of thumb) then decrease the same. The body I worked u to 24. Shamefully I didn’t take too much notice on the legs and and arms 😦 The ears are simple 12 stitch circles. My plan it to take notes next time and look at working my own pattern, which of course will be puplished here for all to see – so for those of you keen to learn how to crochet be sure to check back soon.